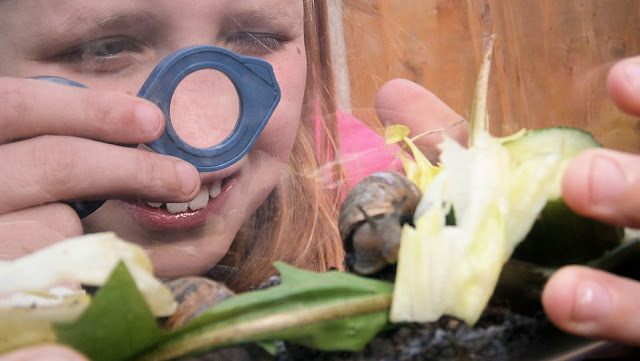 We love being outdoors and love going on bug hunts and taking a close look at nature. Being outdoors is so beneficial for children in so many ways, all the obvious fresh air, vitamin D and exercise but also there are so many things to learn and explore outside. It doesn't matter if you live in the country or in the city you can still find lots of bugs and beasties to investigate, and if you are not sure where to start then why not take a look at the Living World sets. 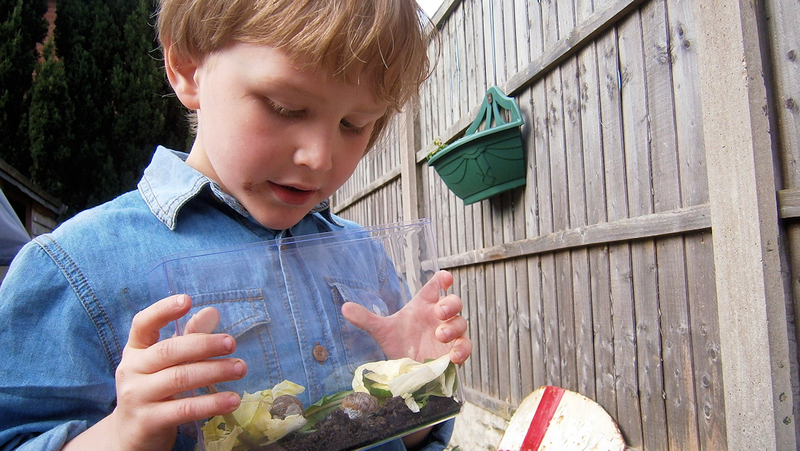 These great box sets are designed for children and created by Nature expert Nick Barker. There are lots of different sets to choose from including ants, spiders, ladybirds and snails. 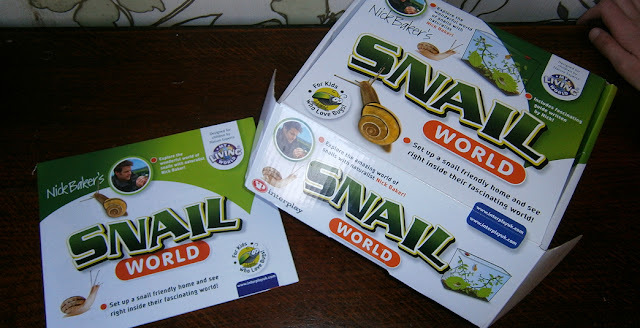 We were asked if we would like to review the Snail world. Included in the set is a small clear tank with lid, a collection pot, tweezers and pipette to help with collecting your specimens and a field microscopic lens enabling you to see the creatures upclose. Everything you need to go an a real bug hunt in your garden. Also included in the set is an information booklet. This booklet is full of child friendly bite sized bits of information. Beautifully illustrated with photos. 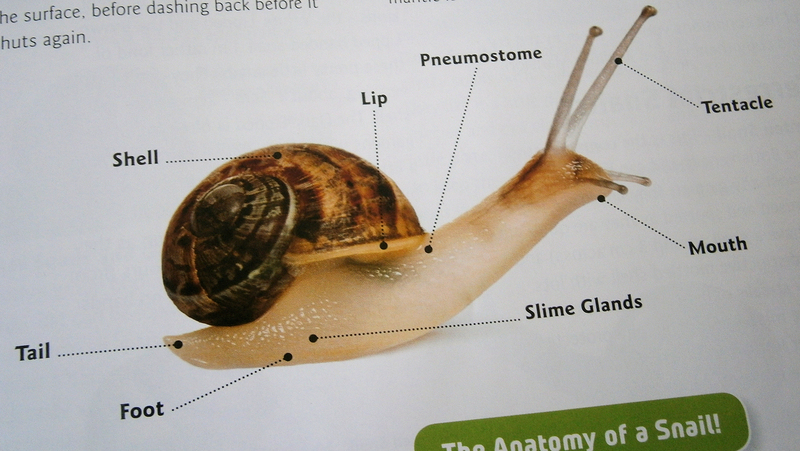 The information is set out in a clear way with question and answer sections and diagrams of a snails anatomy. 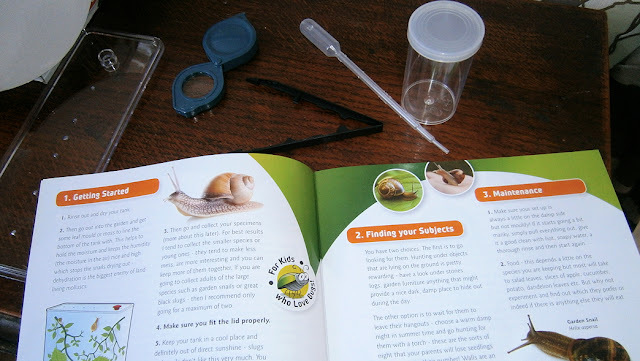 This is one of the best information booklets I have seen in a childs set and is something which all the children have enjoyed reading even before we set off to find out snails. I have in the passed had an Ant World, and we had a bit of trouble with them, finding and keeping hundreds of ants inside your childrens bedroom isn't always so fun especially if the Tank gets knocked over! 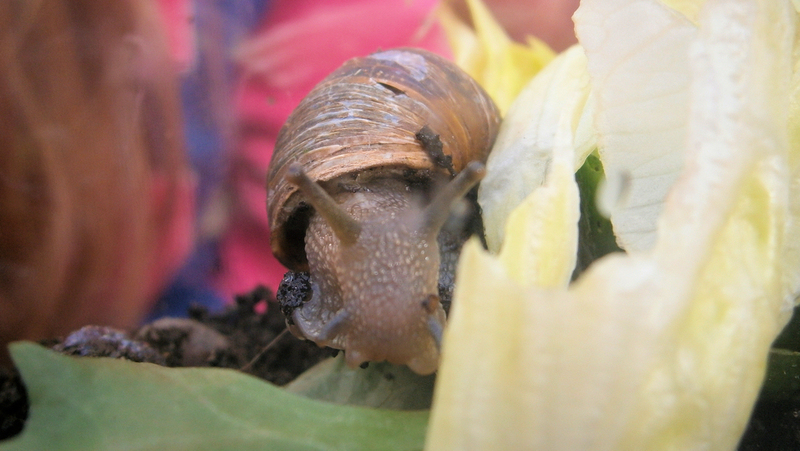 But I do like Snails and we often find them in our garden and I enjoy watching them. I know snails can be a gardeners pest but I really do find them interesting and rather cute! So as soon as the sun shined we set out into the garden to find some snails to join our tank. 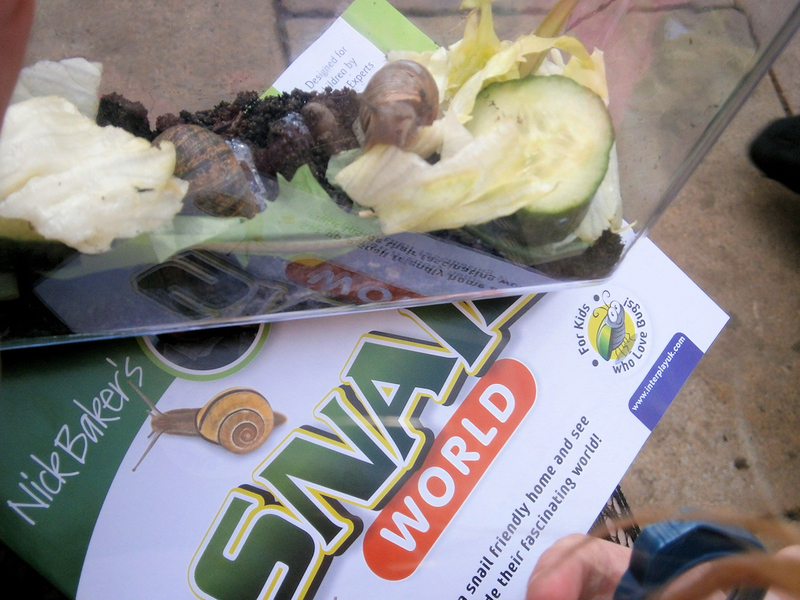 We prepared the tank following the instructions in the leaflet and got some salad leaves for the snails. The children quickly found a couple to take up home in the tank and spent a happy afternoon watching them. This really is a great kit priced at £9.99 it would make a great gift for any budding naturalist, the extras are great and can be used for other species too making this a reusable set and good value for money. 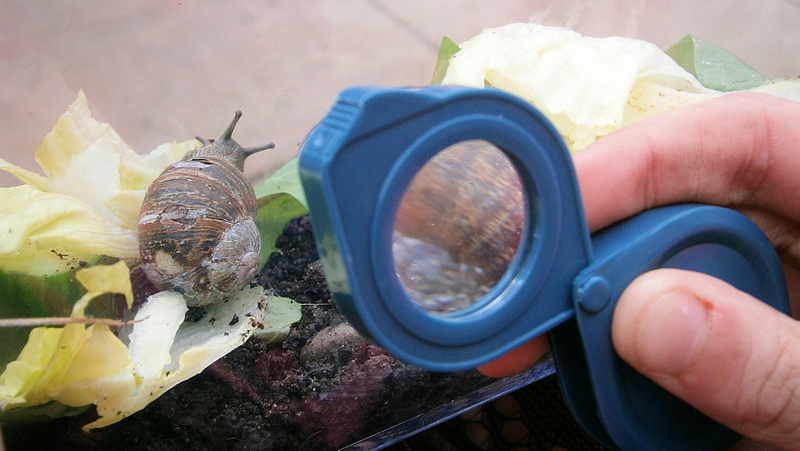 Once you have studied the snails you can set them free and go on a hunt to find other insects. If you are looking for something to encourage children into the outdoors then check out the range on Interplays website : My Living World Then get outside and go on a bug hunt! oh yes I've seen the butterfly sets they do look great I might get Chloe one for her birthday!